Here's a little teaser to start things off. I like to imagine a small band of hominids living somewhere in Africa some 50,000 years ago. These hominids, anatomically like modern humans, were much more intelligent than we might expect. They could make a variety of tools, had tamed fire, engaged in communal hunting, had a rudimentary type of communication, and so forth. They stood at the very threshold that separates true human beings from even the most intelligent hominids. Then two children were born to this band, children who were the first true humans because God gave them spiritual souls. They would have been nurtured by their hominid parents, and would have learned the quasi-culture of the band, but they were truly different. In the depths of their spiritual souls flashed creative intuitions that lay at the roots of abstract language, art, innovative technology, and genuine self-consciousness and freedom, and an awareness of God. As these children grew, they soon outpaced their parents and were drawn to each other. They instinctively recognized each other as different from the rest of the band. They could look into each other's eyes and see true self-awareness. I like that fantasy by my good friend very much, as I imagine that's probably how things happened. Can you imagine what that must have been like? There they were, the first human beings, awake to themselves and the creation surrounding them, with none of the shame, anxieties and resentments that so cloud the consciousness of most. They also knew "the sound of Yahweh walking in the cool of the garden" (Gen. 3: 8), and so enjoyed a kind of natural contemplation of God. Put in the language of earlier sessions, they were spiritual words of the Word, and were intimately in touch with the Speaker of their own and creation's existence. Christian metaphysics affirms that the creation is a symphony of exquisite harmonies played by God; they could hear these melodies in a way we can only begin to taste in contemplative awareness. Theologians speak of a state of original justice and innocence for the first humans. This means that they did not really have a conscious moral code, nor any sense of being out of sorts with themselves or God. That came later, as we shall reflect upon in our next session. Instead, they acted in synchrony with the innate lawfulness of their own nature and in harmony with the creation around them. If they did something that we today might consider wrong or immoral, it was not out of selfishness, but out of a sense of need. Most likely, they lived very much like their hominid relatives, and were probably just as crude in many ways. After all, this was their culture, so what else did they know? Unlike the others in their family, however, they were able to use language in a new way. In their new state of spiritual consciousness, they could communicate as the rest of the band did, but in a different kind of way. They could also use words to create ideas and to navigate around an inner world as well as the outer one. And so they went around naming things, and whatever name they gave something, that's how it became known in their communication and thoughts. Unlike their family, too, they could project themselves into the past or the future using these word/thoughts, and they could talk about that with each other. Their family seemed not to be able to do this in the same way, and didn't understand what they were trying to say, at times. And so the man and woman developed a special intimacy with each other. They eventually mated and had children, becoming the parents of the human race. It is fascinating to imagine how our first parents experienced the world, but there is only so much we can know about that, of course, and even then we are conjecturing largely from our own experience. Nevertheless, one part of the scenario that still rings true is that we are different from other animals -- even the higher apes and the dolphins -- in many ways that suggest human beings live in another, higher level of being. Human intelligence and consciousness are, indeed, qualitatively different from that of animals. This is not to deny that animals have intelligence and a certain kind of consciousness, and it is likely that hominids, as we shall see shortly, had an intelligence that far exceeded that of the animals we are acquainted with today. But if this qualitative difference is a well-established fact that we continually verify by our own experience and which is demonstrated in the archaeological records by the rich culture of the Cro-Magnons in comparison with their hominid ancestors, what is the root of this consciousness and intelligence? It finds its prime expression in language and in other symbolic activities like art, writing, mathematics and so forth, all skills that no animal exhibits, and all of these things show a certain kind of transcendence of the concrete situation. We could call this kind of intelligence a power to abstract from the particular concrete situation, and to work at another level, and it is intimately connected with our own distinctive kind of consciousness that grasps itself in true self-awareness and a sense of choice. In fact, through an analysis of these basic human experiences, that is, self-awareness, choice, language and so forth, that we could reason to a qualitatively different principle that gives rise to these abilities. Let's call it the human spirit, or soul, a spiritual soul that must in some way transcend matter if we are going to be able to transcend the limits of our material circumstances and think and speak and act in the way we do. In the Biblical account of creation, the creation of humans is set forth on the 6th day, after the creation of light, earth, plants, animals and everything else. The recognition, here, is that human beings are a new kind of creature -- ones created in God's very image and likeness. Later Christian theologians came to consider this "image and likeness" to be referring to the human spiritual soul. The "image" of God refers to the soul as a spirit with conscious intelligence and freedom; the "likeness" of God means that the first humans were perfect as God is perfect -- they were "themselves" without distortion, and had no evil or sin in their nature. With the Fall (covered in our next session), this likeness unto God was lost, but the image of God remained. We are and forever will be spiritual beings, as the soul, being a spirit, is immortal. Let's turn, now, to the topic of metaphysics proper. Given the understanding of human beings created in God's image and likeness expressed above, and considering the understanding of creation expressed in previous sessions, we can now make a number of observations. These will be enumerated as notes, or sketches, which can serve to stimulate the intellect and/or imagination unto further discussion on the forum. 1. It was necessary for the animal soul to develop to the level of the more advanced primates before the human soul could be given. Anatomical features like a complex brain, upright walking, binocular vision, opposable thumbs, along with the more sensitive tongue and vocal cords we find in humans all make it possible for the soul to fully express itself in a human body. Of course, it's possible that the giving of the soul helped to select for these features -- a "chicken-and-eggs" situation. 2. The animal and vegetable soul continue to exist in humans and continue to operate in their own domain of lawfulness. In common parlance, for example, we've come to use the term "vegetables" to refer to people in a coma, while "animals" are people who show little sign of spirituality (intelligence, reason, awareness). The terms, animal and vegetable soul, are hardly used any more, however; modern references to physiological and psychological levels of human existence have pretty much replaced them. I will use the terms vegetable and animal souls, however, as these refer more to metaphysical levels of being than do the modern terms. 3. The spiritual soul is the principle of life for the animal and vegetable soul, informing their functioning while also drawing from them information upon which to act. You might say that in a human being, these lower levels now exist for the soul and are transparent to the soul. Physiological life, for example, is now profoundly affected by the exercise of reason and freedom; and "animal life," too, has become transformed so that our feelings, memory, imagination and instinctual drives have become "spiritualized" in such a manner as to help the soul evaluate its inner dispositional states. 4. The classical teaching is that the soul is given at the moment of conception. The reasoning behind this position is that the soul, being the principle of life for all other levels of being, must be present to both inform and guide the development of these levels from the beginning of human life. There have been other viewpoints, however, even by Thomas Aquinas, which postulated that first the vegetable soul emerges in embryonic development, then the animal soul, then, when sufficient complexity is reached, the spiritual soul is given. Of course, no one can know with any degree of certainty what the truth of the matter is, here, so giving the benefit of the doubt to defined teachings would seem to be the best "default position." 5. As with all spirits, the soul is an indivisible whole; its awareness, intelligence and freedom do not reside in different "parts" of the soul (though they may be dispersed in different ways throughout the body), but constitute different aspects of the consciousness of the soul. 6. As a spirit, the soul is also immortal; it was created to live forever. It has a beginning, but no end, as its manner of being transcends the limitations of matter. The traditional view was that beings living out of the animal and vegetable levels simply cease to exist with their death. 7. While spiritual, the human soul is not like angelic spirits, which do not have physical bodies. Rather, we say that the soul is "embodied," and exercises itself in a physical human body through its own intelligence (and in co-operation with the animal and vegetable souls). 8. From the above, it follows that a soul without a body is metaphysically deficient. We are not "spiritual beings having a human experience" as the popular New Age saying goes (which implies that we could be -- or have been -- another type of being besides human). 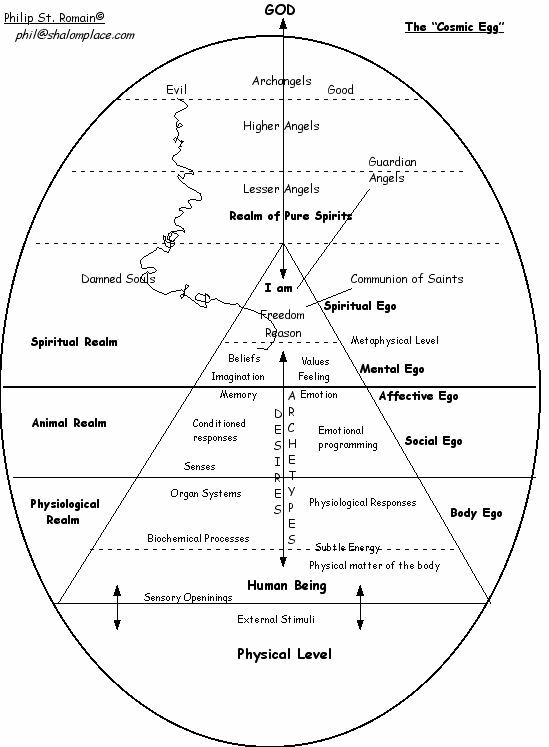 The type of spirit we are is a human one, which is metaphysically oriented toward both matter and transcendence. That is why the Hebrews thought that when one died, the body rotted away and whatever went on was a kind of metaphysical shadow of a human, residing in Sheol where it was completely unable to exercise its spirituality. This insight points up the importance of the resurrection of Christ's body, which will provide a new metaphysical foundation for the human spirit. More on this in session 6. 9 The spiritual intelligence of the soul is such that its activation depends upon sensory information to stimulate its faculties. Without such stimulation, the spiritual potential of the soul remains dormant, or latent, and cannot emerge (consider the case of Helen Keller). Hence, we can say that the soul is a type of spirit that is fundamentally oriented toward animating matter (through the vegetable and animal souls), from which stimuli its own spirituality is awakened. 10. The animal and vegetable souls are "weak in being" and are thus capable of giving rise to millions of species of animals and plants, respectively, to express the potentiality of these levels of being. In contrast, Thomas Aquinas wrote that angelic spirits were such that each individual constituted an entire species because its intensity of being and the completeness of its self-knowledge precluded the possibility of their being two identical entities of such. The human soul stands between the angelic and animal levels, possessing the qualities of intelligence and freedom found in all spirits, but lacking the intensity of being found with angels. Hence, there is but one human nature (species), but there can be billions of individual instances of this level of being. 11. Every human being possesses an individual soul, which constitutes that individual as human and in possession of a human nature. Collectively, human beings comprise the one human race. Hence, there is a sense in which this metaphysical condition drives human beings to seek one another to discover other individual instances of human nature, and to even become communities. Our primate nature also moves us to social relationships, as does the echo of Trinitarian life found in our very being. Human beings are therefore essentially relational, and know themselves most truly in a context of relationships with other humans, creation, and, of course, God. 12. Finally, we note that the classical teaching is that every individual soul is a direct creation by God rather than an emergent reality. The father and mother share with God in the creation of a human being through the usual manner in which animals propagate their own kind (communicating vegetable and animal soul in the reproductive process), but it is God who infuses an individual soul into each individual, calling us each by name to a particular destiny. Just how well this teaching will survive in an age of cloning and other reproductive technologies remains to be seen. How do Ego states relate to the different levels of being? 1. What questions or comments do you have from this session? 2. How has your prior understanding of human nature been stretched or re-affirmed by this session? 3. Any other sharing. . .
Did the novelties we associate with human consciousness emerge from physical processes? IOW, could they have arisen from those primitives known to science as space, time, mass and energy pursuant to the known laws of physics? Good questions, JB (and great links). No one can know for sure what the answers are, but some explanations seem more compelling than others. To me, the analogy between brain and soul is like TV waves and a TV, respectively. You need the TV to transmit the signal, but without the signal, the TV would be just a complex machine that would heat up in some areas when you turned it on. What are your thoughts on this, JB? You've done a lot of dialogue on this topic through the years. Others - how do you understand/experience soul? How did this session speak to that understanding? Good questions, JB (and great links). No one can know for sure what the answers are, but some explanations seem more compelling than others. The philosophy of mind issues get very technical and jargonistic. Let me just say that I am intrigued by ALL the models of consciousness and ALL the metaphysical accounts of the soul and/or its capacities. Whoever ends up being right about it, and that could be LONG after we're gone, the salient issue seems to be that the human experience is radically social, radically relational. Is there irreducible complexity which justifies a design inference? Does modern cosmology justify a strong anthropic principle? Perhaps future advances in statistical models can be applied, some day, to mounting indirect evidence for such, but, for now, in my view, such arguments are highly speculative, which is another way of saying weak. Whether the emergence of consciousness was more random than systematic, came from order or chaos, pattern or paradox, chance or necessity, direct ensoulment or biophysical process, is not the BIG issue, although we will learn much from the implications of same some day, should we ever figure it out. The BIG issue is ... ... ... What do YOU and you and you say IT is? The BIG issue is ... ... ... What do YOU and you and you say IT is? Not to leave anyone hanging, I already said the BIG salient issue is that we are radically social and radically relational. As far as our social-relational existence, then, to whom can we go? There is One, Who made some radical claims regarding that most pressing existential question. The metaphysical speculation and worldview models that support those claims are not unreasonable, or are at least as reasonable as any other approaches, and warrant serious consideration, in my view, by all that we have and with all that we are. Phil....The BIG issue is ... ... ... What do YOU and you and you say IT is? There is a dialogue going on....and we are tuning into it...like turning the radio dial and picking up a number of transmissions....listening for meaning in them...including with our own souls. I feel these beings through the ages talking in other voices, sometimes in my own perception, sometimes through my own voice, although I can distinguish their voices from my own. I feel our voices blending in moments, and then moving apart, like many roads crossing and meeting in insights and in moments of the heart especially. It is a dialogue aross time and space and sometimes in different languages. Yet the language of the heart is able to understand the words on a deeper level even when they might be foreign to me at this time in this age. I feel the deeper reasons why we touch. I feel the essence of Oneness moving the energy and guiding us to the crossings where we meet. to receive what they are saying, no matter how different it is from what I am familiar with, the voice will become familiar in the truth of the inclusive energy of love....in its highest sense. Even when the voice I hear or read is exclusive and is following a closed path toward a goal of their own, if I don't close down, I can hear what they are saying and try to understand why they are driven in that direction. It doesn't mean I accept that as a path for myself, but I keep the dialogue open if I can remain in what I call "divine listening." I began to have a divine conversation throughout the day and throughout the night that yields "divine insights".......and whenever that happens, I know they are for everyone. multi-faceted dimensions of myself. Someone else might relate to it, but that is not the same as receiving a higher inclusive manifested wisdom that could be gift to ALL. Many of the higher beings of the past, our prophets, the enlightened voices, have had the experience of not being understood or heard by anyone. The isolation....or separation....or being set apart in some way.....sets up a condition to hear other voices than our own.....as a kind of imposed silence where something new can happen. Being willing to experience that aloneness....is one of the ways that we say yes to a higher possibility, where we move higher on the spiral of evolution and become more open than we were before. It is not higher in status or rank or in any way making us superior, it is higher in being able to listen from the power of ten instead of the power of one.....like from a mountain top.....or from heaven....or beyond heaven.....and however we are able and willing to let our minds be led to an open state to hear each other in the dialogues between us here on earth. When the divine listening can become vertical as well as horizontal, and it can go in any angle, we find the point where it intersects from all directions. Think of a star....or an asterisk......or a grid where all lines intersect.....the hub or axis is our point of Oneness. We tend to think of a grid surrounding the earth, but we need to think larger in a grid of the universe....and the ultimate voice is at the center of it. How do we make a grid around the universe that extends beyond heaven......I think of it created with energy.....and the only energy that does not and will never yield to measuring is LOVE. It becomes the encoded truth in everything, in every growing thing, in all life, and in ourselves. Love is always waiting to be unleashed or revealed. I tried to set up an absolute for my life, so I could always be guided to know the true way. I asked that I would hear no voice but God's. I didn't want to channel anyone, to let any foreign voice into my unconscious or subconscious or my conscious mind. I began to laugh and realize "divine humor" when I started to realize in time that God's Voice included and invited all voices. I had excluded no one. I had invited them all to enter the divine conversation. I began to attract an amazing variety of voices that longed to be heard. I began my divine listening, and it continues to evolve into a divine conversation of which you are all a part!! Isolation. Separation. Being set apart. This resonates with the theme of brokenness, with the idea that there is some type of rupture between our idealizations and realizations (or, jargonistically, between the essentialistic and existentialistic). Why this rupture? When and where did it happen and to whom? What is it and how do we experience it? Is it real or illusion? Any good Theory of Everything must account for same? I enjoyed the rest of your sharing, Naomi. The above really caught my attention. If the sine qua non, je ne se quois and raison d'etre of human nature is radical relationality, then isolation, separation and being set apart are the very bane of our existence. I hear this as an echo of Alfred North Whitehead's observation that any creative advance takes place only along the borders of chaos. Some thus appeal to a process metaphysics as a companion to their outlook on spiritual growth and/or systematic theology. According to much contemporary psychology the growth, freedom, and maturity of the individual entail an embracing of polarities and antitheses in one’s psychic life. Inevitably such expansiveness of soul means acquiring a certain vulnerability to what is envisioned prima facie as perhaps the very opposite of one’s "primordial" self-image. Dipolar theism, according to Charles Hartshorne, understands God as both absolute and relative, abstract and concrete, eternal and temporal, necessary and contingent, infinite and finite (DR). The being of God does not exclude but rather includes the being of the world (PSG 1-25; 499-514). One of the basic images suggested by dipolar theism is that of the embodied God. God’s being is imaged as including the physical cosmos, with all its richness of texture as well as its imperfection and chaotic elements. It is pictured as embracing humanity, man’s glory and man’s failures, his ecstasy and tragedy, the totality of nature’s and man’s being. So, in this step by step dialogue, I have tried to show how Naomi's thoughts could be squared with yet another metaphysics, that of process. Of course, they can be squared with many others, too. When it comes to "locating" the rupture(s) I mentioned above, the traditional thomistic approaches, which emphasize substance rather than process, mostly speak in terms of ontological ruptures, located in the past. Process approaches speak in terms of teleological ruptures (or, strivings), mostly located in the future. Perhaps we could say that semiotic approaches (sign theories) would speak in terms of epistemological ruptures. Whatever the case, it does not seem unreasonable to suggest that we are alienated from being (ontologically), beauty (cosmologically), truth (epistemologically), goodness (axiologically), and love (teleologically) ... or, from God, Who is Primal Being, Primal Truth, Primal Beauty, Primal Goodness and Primal Love. Whatever our model of causality or metaphysics, we experience separation and alienation from our Primal Cause. Some equate this with the gift of human freedom, that the very fullness of God shrunk to make room for created co-creators (Phil Hefner's term). It was God's way of saying: You see things the way I do? Well, what are YOU going to do about it?. You see things the way I do? Well, what are YOU going to do about it? Our human nature, being radically relational, radically social, then experiences this call as What are WE going to do about it? As they say, we only invoke because we have previously been convoked. Any well considered and truly measured response to the human condition, then, would seem to require an element of God is with us? This alienation, this isolation, this separation must not stand, cannot perdure. Thus for singers like James Taylor, every song is about going home and such a quest becomes the grail, itself. The journey, for now, is my destination. Re. the relationality of the soul, this is nicely accounted for in point #11 in the opening post, where I merely recount a traditional perspective. Every time I reflect on this topic, I'm also struck again by the holistic vision behind it. Maybe we learned that body and soul were two separate and somewhat opposed things, but that's not really the traditional viewpoint. Body and soul exist for each other, and both are very good! Yes, that's the starting point for anyone seeking understanding. The next step, however, is to try to explain WHY one says what it is. That's where a metaphysical tradition can be helpful -- at least in providing a reference point, if not a corrective, in some instances. I tried to set up an absolute for my life, so I could always be guided to know the true way. I asked that I would hear no voice but God's. I didn't want to channel anyone, to let any foreign voice into my unconscious or subconscious or my conscious mind. I began to laugh and realize "divine humor" when I started to realize in time that God's Voice included and invited all voices. There's a very profound mystical insight, there, Naomi. And I think it resonates with the less poetic metaphysical teaching about everything being an expression of the Word, which means that everything must be vibrating with something of God.
. . . So, in this step by step dialogue, I have tried to show how Naomi's thoughts could be squared with yet another metaphysics, that of process. These are two ways, then, in which God can be understood to be involved in an emergent universe: first, by creating a universe capable of emergence and, secondly, by becoming relationally involved with the creation itself. The first way affirms a kind of presence of God at the heart of creation -- that there remains a fundamental bond between the Speaker and the word. Thus might a creature know its connection to God as Creator, and know God indirectly through the fact of its existence. The second way is a recognition of God as Other or beyond/transcendent to creation and, hence, One with Whom we can enter into relationship if it so pleases God (which, of course, we believe it does). These two ways resonate with traditional Christian insights and recognize that creation, in its relationship with the divine, can be influenced to act one way or another with consequences ensuing to other creatures. Any well considered and truly measured response to the human condition, then, would seem to require an element of God is with us? What a great flow of topics we have, here. each other!!! God in grace and compassion incarnates into our loving foolishness and unites us all. JB quote: This resonates with the theme of brokenness, with the idea that there is some type of rupture between our idealizations and realizations (or, jargonistically, between the essentialistic and existentialistic). Main Entry: sa·cred Pronunciation: 'sA-kr&dFunction: adjectiveEtymology: Middle English, from past participle of sacren to consecrate, from Old French sacrer, from Latin sacrare, from sacr-, sacer sacred; akin to Latin sancire to make sacred : to be dedicated or set apart for the service or worship of a deity. We can be set apart for many reasons! Wasn't Jesus set apart? In the desert he could hear God more clearly as he faced temptations, and he stood alone in rebuking them. His choice set something new in motion for all of us. Angels have been mentioned a couple times. What of angels? and JB's links to the demonic, what of that? I've often wondered what is "our cross", i.e., "pick up your cross and follow me". Is this isolation, this separation our "cross"? I touched on that very briefly in this session and the previous one. In terms of metaphysics, they could be considered spiritual beings who have no need for a physical body to activate their intelligence. They are "pure spirits," if you will, each having a distinct mission. In our next session, we'll touch briefly on the tradition of fallen angels, and their role in frustrating God's plans. I recall a few years ago there was quite a bit of interest in angels, with a number of popular books detailing encounters with them. I've browsed through some of these and found them heartening in many ways. Have any of you had contact with what you believe to have been angels? What about angels? A question that could set off a firestorm of misinformation and projection and sweet stories. Yet, the fascination is part of our yearning toward the divine wherever we encounter it. What about the demonic? A question that could set off a firestorm of misinformation and projection and fear. Yet, the fascination is part of our yearning to know something of darkness wherever we encounter it, especially in ourselves. spirit that bring "a higher perception and a new "angle" of God than we were previously able to grasp or even imagine." My two favorite words are love and spirit. I am not only process oriented; I am spirit oriented. My experience with the Divine falls into those elusive categories. I claim nothing, except to continue to try to Love with my whole heart, my whole soul, with all my being, with my whole mind in surrender, and my belonging flows from my human spirit being placed within me to touch Divine Spirit in the wonder and mystery of Love. Even you, JB, said on your website, in the last line, "Love, then, is our philosopher's stone." The quality and joy and the peace of my life speaks to the integral truth of what I say FOR ME. I would not presume to speak for anyone else. My theory of everything is to be open to all. Isn't that embedded in the inclusiveness of Jesus as he put his arms around a broken world? "Everyone is right." It has the ongoing magic of inviting all into the divine conversation, excluding no one. The demonic spirit enters when only one is right, and the rest of us are condemned if we don't agree.